Lineal Ancestry of the STONE Family in Australia researched and written by Shane Stone. A family history is a very big undertaking. As Mark Twain once wrote 'Why waste your money looking up your family tree? Just go into politics and your opponents will do it for you'. There was every chance of that. ‘The Fatal Shore. 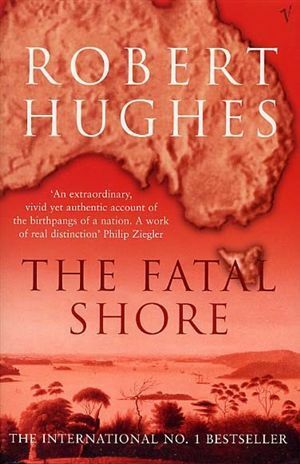 written by the late Robert Hughes and published 1987 is a defining work, an Australian classic that offers a greater understanding of who we are and where we have come from1. Together with the Bicentenary Year celebrations in 1988 and the many publications and commentaries that flowed since that important milestone in our European history there has been an awakening, one might say almost a discovery of who we are and where we came from. ‘Deep in Australian life seemed to wish that “real” Australian history had begun with Australian respectability - with the flood of money from gold and wool, the opening of the continent, the creation of an Australian middle class. Behind the diorama of Australia Felix lurked the convicts, some 160,000 of them, clanking their fetters in the penumbral darkness’. Add to the above the waves of migrants, mainly working class people fleeing a harsh life and exploitation seeking a new opportunities and a picture of Australia, a new country starts to emerge. There were also the refugees from war torn nations, civil strife as well as economic turmoil; some things don’t change. And there were the original people – Aborigines, Torres Strait and Tiwi Islanders. Just for good measure throw in the ‘kanakas’, ‘Afghani’ camel drivers and the ‘coolies’ and there is a much bigger story to tell about Australia. It’s a compelling yarn about one of the most culturally diverse democracies in the world. “We should have kept the convicts in England and sent the rest of Britain to Australia”. Many did follow in the footsteps of the convicts to make a new home in a new country. The Stone Family in Australia is such a story – working class folk intermeshed in marriage with convicts including the First, Second and Third Fleets and later arrivals before ‘transportation’ was abolished. The story of Australia is one built on migration and the STONEs like many other families have been part of the Australian story. This is our tale of coming to Australia and making our way. It is also a tale about our forebears and a documented Register Report back to Elizabethan times tracking the STONE line. Placing the STONE Family in context most Australians have a mixed ancestry given the nation post 1788 was built on successive waves of immigration. Overwhelmingly current STONE Family members (referenced from Jack and Madeleine STONE as Home Persons in the genealogical chart) have an English blood line commencing with a maternal 6th great grandmother First Fleet Convict Ellen WAINWRIGHT born Corner of Preston, Lancashire and a 6th great grandfather and Third Fleet Convict Thomas GUY born Little Rissington Gloucestershire. 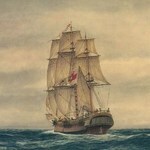 Ellen arrived on board the Prince of Wales in Botany Bay 1788, one of the first white European women in the new colony. Our line of descent in Australia includes convicts from the 2nd, 3rd and 4th fleets as well as subsequent transportations. 5th and 4th great grandfathers on the maternal side were convicts as were a number of great uncles and aunts of that era. Thereafter successive family members of English origin came from Plymouth; St. Helier, Jersey, Channel Islands; Droylsden, Lancashire; Birmingham; and Manchester. The English blood line is reinforced through the direct patrilineal line of descent - 2nd great grandparents and free settlers John and Harriett STONE (nee LOWDER) born Plymouth and Honiton respectively in Devonshire as set out in greater detail below. Irish ancestry is through a direct matrilineal line of 2nd great grandparents Michael and Mary DEVINE (nee HASSETT) both from Clarecastle/Ballyea, County Clare. Also a 2nd matrilineal great grandfather Thomas O’GORMAN from County Limerick; a matrilineal 2nd Great Grandmother Annie SCHOFIELD (nee McDERMOTT) from County Roscommon, Dublin; and a matrilineal 3rd great grandmother Ellen Augustine BILSTON (nee McELLIOTT) from Listowel County Kerry. Scottish ancestry is through patrilineal great grandparents James and Catherine CURRIE (nee McARTHUR) both Glasgow born. The CURRIE line (spelt in one document CERRY) appear to have originated in Ireland. Glasgow was home to a large expatriate Irish population over generations many of whom found their way to Australia. Enter the Scots through a matrilineal 3rd great grandmother Janet aka Jessie CAMERON of Clan Cameron Nair, Inverness and her father 4th great grandparent Donald CAMERON born Contin, Ross - Shire; also a matrilineal 3rd great grandfather James Henry aka Howie THOMSON born Edinburgh, his mother 4th great grandmother Elizabeth THOMSON (nee BROWNLEE) born Strathaven, Lanarkshire. THOM(P)SON has not todate had a chiefly line recognised by the Lord Lyon. I am told with authority we may wear the CAMERON tartan as members of one of the sept CAMERON families3. CAMERON’s fought at Bannockburn with Robert the Bruce against the English on 24 June 1314. The CAMERON’s were Jacobites who fought in support of Bonnie Prince Charles at Cullendon on 16 April 1746 where they suffered horrendous casualties. Achnacarry is the ancestral home to the modern (post 1655) Chiefs of Clan Cameron. The name “Achnacarry” is from the Gaelic named “field (achadh) of the (na) fish-trap/weir (caraidh).” It is located on the isthmus between Loch Lochy and Loch Arkaig, where Arkaig’s waters run out into the south end of Lochy. In more recent times as a direct consequence of the shift in Australia’s immigration post World War II there is a Yugoslav blood line through marriage (Balinci & Lika, Croatia and Jablanica via Ilirka Bisterica, Slovenian). The Croatian blood line has its origins in Germany with over four generations in what was the Austro-Hungarian Empire, later Kingdom of Yugoslavia and after WWII the Socialist Federal Republic of Yugoslavia (SFR Yugoslavia or SFRY); nowadays the Republic of Croatia. Slovenia was at various times part of the the Holy Roman Empire, followed by the Austro-Hungarian Empire. It too joined with the Kingdom of Yugoslavia and after WWII the Socialist Federal Republic of Yugoslavia (SFR Yugoslavia or SFRY); nowadays the Republic of Slovenia. Immigration to one side overwhelmingly the numbers rest with STONE Family members born in Australia post 1788 and through successive generations inter married with new arrivals. The STONEs came from Devon. The convict line came from Lancashire. Farewell to old England for ever, Farewell to my rum coes as well, Farewell to the well-known Old Bailey Where I used for to cut such a swell. Chorus: Singing too-ral, li-ooral, li-addity, Singing too-ral, li-ooral, li-ay, Singing too-ral, li-ooral, li-addity, And we’re bound for Botany Bay. There’s the captain as is our commander, There’s the bo’sun and all the ship’s crew, There’s the first- and the second-class passengers, Knows what we poor convicts go through. ‘Taint leaving old England we cares about, ‘Taint cos we mis-spells what we knows, But because all we light-fingered gentry Hops around with a log on our toes. These seven long years I’ve been serving now And seven long more have to stay, All for bashing a bloke down our alley And taking his ticker away. Oh, had I the wings of a turtle-dove, I’d soar on my pinions so high, Straight back to the arms of my Polly love, And in her sweet presence I’d die. Now all my young Dookies and Duchesses, Take warning from what I’ve to say: Mind all is your own as you toucheses Or you’ll find us in Botany Bay. 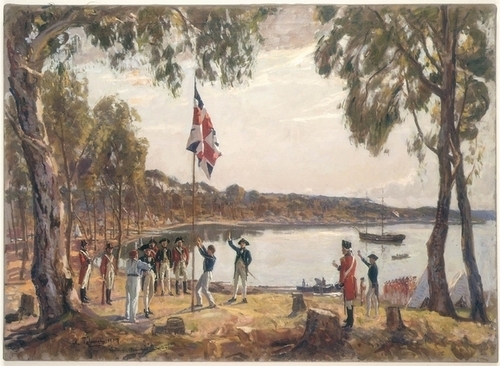 The Founding of Australia by Captain Arthur Phillip R.N. 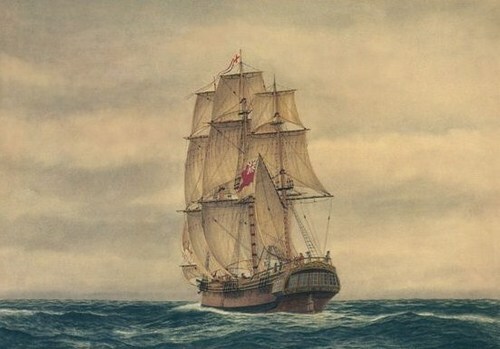 Sydney Cove, 26th January 1788, Algernon Talmadge R.A, 1937. Courtesy State Library of New South Wales.